I based this recipe on Three Ingredient Chocolate Bars, but modified it to use turbinado sugar because I’m slightly skeptical of stevia and good raw honey is stinking expensive. I used sunflower seeds that were halfway between soaked and sprouted. I’ve found that if I soak them is saltwater overnight, drain them and stick them in the fridge, they very slowly sprout with no further attention needed. For the mixing coconut oil and sugar stage my actual process looked more like, “Try to mix turbinado sugar with coconut oil. Try harder. Leave it for a while and see if turbinado dissolves in oil. Discover that it just doesn’t. Try heating it again. Finally try adding a splash of water and declare the odd, gloopy almost mixed substance a success.” You get the modified version below, and once you mix in the cocoa powder everything blends together just fine. Melt coconut oil in medium saucepan. Remove from heat and mix in sugar and water. Return to heat if necessary get sugar to dissolve. It doesn’t have to mix neatly, but if you still have granules your chocolate will be grainy. 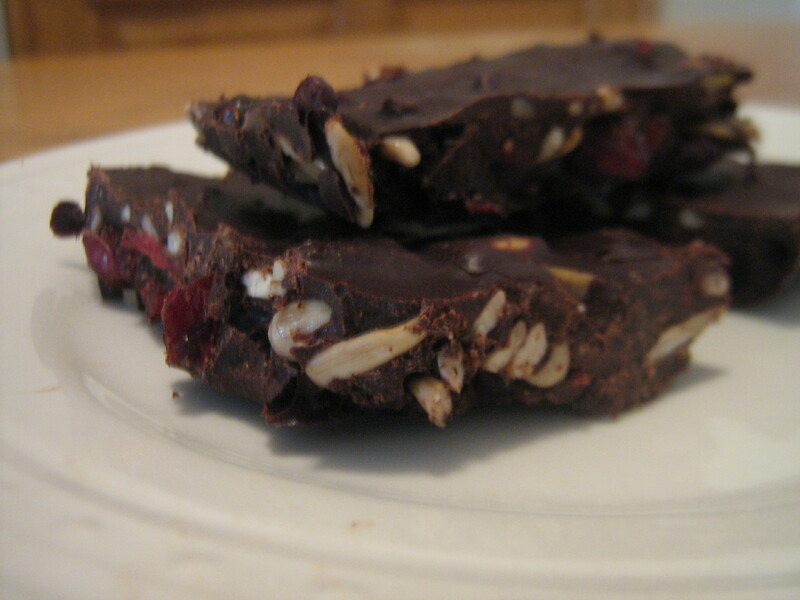 Pour chocolate mixture evenly over cranberries and sunflower seeds, smoothing slightly if necessary. Makes 15 ‘fun sized’ bars.